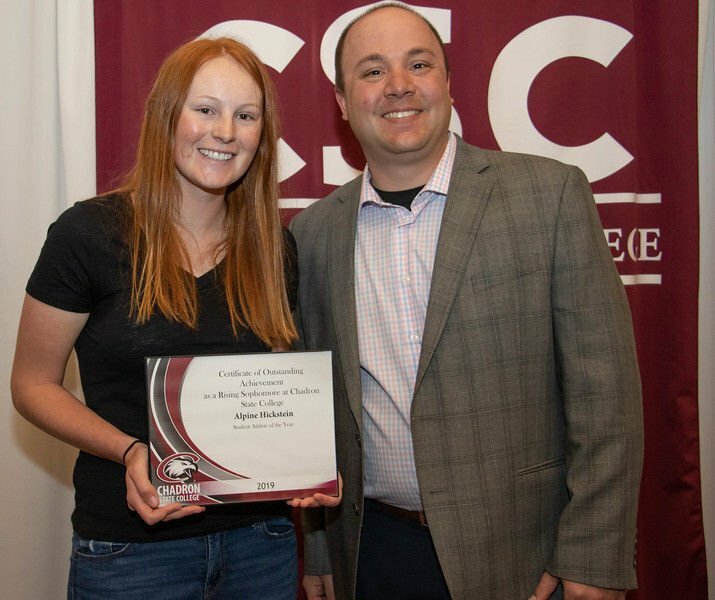 Student Athlete of the Year award winner Alpine Hickstein of Chadron, Neb., left, poses with Chris Green at Chadron State College's Rising Sophomore Award Ceremony Thursday, April 4, 2019, in the Student Center Ballroom. The James H. Powell Jr. Academic Achievement Award winner Estabon Bozeman of Los Angeles, Calif., center, poses with Karla and Dr. Jim Powell at Chadron State College's Rising Sophomore Award Ceremony Thursday, April 4, 2019, in the Student Center Ballroom. The 2018-19 Young Eagle winner Tyreek Bryant of Denver, Colo., right, poses with the 2017-18 Young Eagle Celeste Cardona at Chadron State College's Rising Sophomore Award Ceremony Thursday, April 4, 2019, in the Student Center Ballroom. The fourth annual Rising Sophomore Awards Ceremony honored outstanding Chadron State College freshmen Thursday at the Student Center. The awards were established by the college’s retention committee as a way to recognize students who have gone above and beyond in a variety of categories during their freshman year. Award winners were nominated by faculty, staff or peers. Instructor Brittany Helmbrecht delivered the keynote address. She reassured students that changing majors is a normal part of college life and their involvement in jobs and clubs on campus provide opportunities to explore future career options. Helmbrecht teaches Health, Physical, Education, and Recreation courses and is pursuing a doctorate in Health Education from A.T. Still University. Celeste Cardona, last year’s Young Eagle award winner, spoke about the importance of overcoming failures, persisting in college and choosing healthy options to manage stress. She presented the award to the 2018-19 Young Eagle recipient, Tyreek Bryant of Denver, Colorado. The Young Eagle award recognizes a rising sophomore who has made significant accomplishments as a leader who has positively affected positive change on campus. James H. Powell Sr., dean of Applied Sciences, Curriculum and Assessment and Accreditation, and his wife, Karla, presented the James H. Powell Jr. Academic Achievement Award to Estabon Bozeman of Los Angeles. This award and its $500 scholarship recognizes a rising sophomore who participated in the Transitional Studies program and has demonstrated excellence while achieving academic goals. Damien Zuniga of Colorado Springs, Colo.
Madilyn Barraza of Scottsbluff, Neb. Davon Johnson of Ballwin, Mo. Michelle Nett of Cheyenne, Wyo. Collin Sanders of Merriman, Neb. Kelsey Crock of Cheyenne, Wyo. This award recognizes a rising sophomore from the residence halls for outstanding service to her or his floor. This student has demonstrated engaged citizenship, including leadership, self-governance and peer accountability. They are respectful of all members of the community and have positively contributed to the Residence Hall organizations. Most importantly, this individual is a leader and role model for his or her peers and consistently serves his or her community to enact positive changes within it. Jahani Wright of Miami Gardens, Fla.
Sarah Wagoner of Mitchell, Neb. Caprise Cominiello of Burlington, Colo.